with other collectors from around the world. Philately is one of the oldest and most popular forms of collecting in the world. The legend is that stamp collecting began in a Paris classroom. An inventive geography teacher asked his students to save foreign stamps and paste them on the back of maps of the country of origin in their atlases. This may or may not be true, but the fact is that within a decade of the introduction of stamps, there were avid collectors. 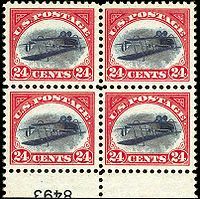 Pictured right: The Inverted Jenny (or Jenny Invert) is a United States postage stamp first issued on May 10 1918 in which the image of the Curtiss JN-4 airplane in the center of the design was accidentally printed upside-down; it is probably the most famous error in American philately. It is also one of the rarest, this version is the only known on that includes the plate number. The last time It was sold at auction it fetched $4,000,000. Pictured right: The Penny Black. The world’s first adhesive postage stamp of a public postal system. It was issued by the United Kingdom of Great Britain and Ireland on 1 May 1840, for use from 6 May of that year. Almost 70,000,000 were printed but The Penny Black is still a highly prized by collectors. Condition is paramount: a poor used version may cost as little £20 ($35), however, Stanley Gibbons recently sold one of its finest Penny Black stamps for £250,000 ($450,000). Postal rates were high until the reform of the postal system by Rowland Hill in the 1800’s. 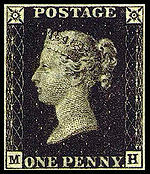 In 1840, he introduced the first adhesive stamp, the “Penny Black”. Up until that time, postal fees were collected when the mail was delivered. Hill insisted that mail be pre-paid and that the stamp be affixed to all mails as a form of receipt. Payment was based on weight, one penny per half ounce. Other countries quickly followed suit. Switzerland issued their first stamps in 1843, and the first federal U.S. stamp – costing a whopping 10 cents – was issued in 1847. The first perforated stamp – another British invention – appeared in 1854. Pictured left: The first stamp issue of the U.S. was offered for sale on July 1, 1847, in NYC, with Boston receiving stamps the following day and other cities thereafter. They consisted of an engraved 5-cent red brown stamp depicting Benjamin Franklin (the first postmaster of the US), and a 10-cent value in blac k with George Washington. As for all U.S. stamps until 1857, they were imperforate. In spite of contemporary trends to use courier companies and email, stamp collecting is as active as it has ever been. Philatelists have dozens of areas in which to specialize – vintage stamps, commemorative stamps, airmail stamps, publicity stamps, error stamps. Each year, post offices around the world cater specifically to collectors with special issues and limited edition stamps. Often, the artwork is inspired and stunning, making this one of the most beautiful realms in collecting. It can also be one of the most accessible and affordable of all obsessions. The Internet notwithstanding, stamp collecting will continue to be one of the world’s favourite pastimes.